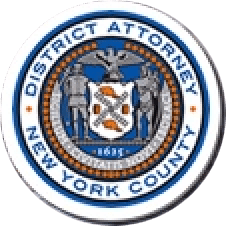 Manhattan District Attorney Cyrus R. Vance, Jr., announced the sentencing of JOVAN CUNNINGHAM, 35, to 2-to-6 years in state prison for stealing approximately $178,000 from an 83-year-old customer at the bank where he was employed. On June 2, 2016, the defendant pleaded guilty in New York State Supreme Court to Grand Larceny in the Second Degree. As part of the plea, the court executed judgment orders, holding CUNNINGHAM liable to repay approximately $166,000. As admitted in the defendant’s guilty plea, between November 5, 2011, and August 1, 2013, while working as a Customer Service Manager at a People’s United Bank branch located at 127 Seventh Avenue in Chelsea, CUNNINGHAM stole approximately $178,000 from a blind, elderly customer of the bank. She was nearly 84-years-old in November 2011 when the defendant began stealing from her. From the time the victim opened accounts at People’s United in 2009, bank personnel, including CUNNINGHAM, would assist her by bringing deposit or withdrawal slips to her apartment for her to sign, and bringing back the small amounts of cash that she had requested. Occasionally, bank personnel would assist the victim by writing checks for her sign in order to pay for rent and other expenses. The victim would occasionally withdraw cash in amounts of less than $100 once every three-to-six weeks. However, the bank account was used mainly for investment purposes. Over time, the victim came to depend on CUNNINGHAM as her primary contact at the bank. Additionally, the victim invested money in U.S. Treasury bonds, and CUNNINGHAM would assist by preparing checks for her to sign to complete these transactions. Between November 2011 and May 2013, CUNNINGHAM withdrew more than $150,000 in cash from the victim’s account in more than 50 separate unauthorized withdrawals. The victim did not authorize any cash withdrawals over $100 and many of these unauthorized withdrawals were between $2,000 and $4,500. During one eight-day period in April 2013, more than $20,000 in cash was withdrawn from the victim’s accounts. The victim was unaware that this money was being withdrawn from her account. She never received more than $100 in cash from CUNNINGHAM at any time. The larceny was discovered when CUNNINGHAM wrote two checks to himself from a separate account of the victim’s in the summer of 2013. Assistant District Attorney Peter Rienzi handled the prosecution of the case, under the supervision of Assistant District Attorney Gloria Garcia, Deputy Chief of the Financial Frauds Bureau; Assistant District Attorney Archana Rao, Principal Deputy Chief of the Financial Frauds Bureau; Assistant District Attorney Michael Sachs, Chief of the Financial Frauds Bureau; Assistant District Attorney Catherine Christian, Chief of the Elder Abuse Unit; and Executive Assistant District Attorney David Szuchman, Chief of the Investigation Division. Investigative assistance was provided by Senior Rackets Investigator Thomas Mullin, and former Senior Rackets Investigator David Moser, under the supervision of Supervising Rackets Investigator Donato Siciliano, Assistant Chief Investigator Michael Wigdor, and Chief Investigator Walter Alexander. Elder Abuse Unit Coordinator Melanie Chan, former Paralegal Julien Tunney, Victim Services Case Worker Karina Farid, and Financial Intelligence Director David Rosenzweig also assisted with the investigation. District Attorney Vance thanked Detectives Ramon Caraballo and Francis Hill of the Muhlenberg Township Police Department and People’s United Bank and Citizens Bank for assisting with the investigation.